Zenith produces a wide variety of collapsible fabric tanks also known as pillow bladders both for temporary and long-term liquid storage. Our tanks hold water, various chemicals, oil, gases, effluents and slurries. Capacities from 300 liters to 300.000 liters are available. Zenith’s Vertex tanks are easily transported and installed quickly with little or no on-site preparation. Bladders have endless applications and typically used for military operations, relief efforts, rural construction sites and many commercial areas. Specialized materials are available for a variety of applications. Please consult our sales team to choose the best material and types of fittings for your needs. 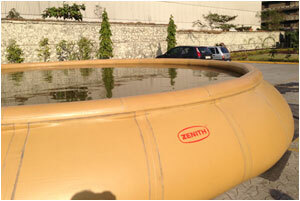 Zenith’s Super-Vertex is capable to store diesel, jet A-1 fuel, oils, kerosene and various type chemicals. Please contact our sales team for more details and a quotation. Zenith is a proud supplier of Indian Military and surrounding armed forces in North Africa, South East Asia and Middle East region. 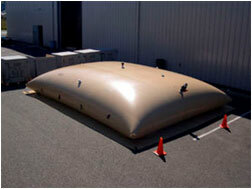 Open top design allows for easy filling of liquids and protects the water source from outside contamination. 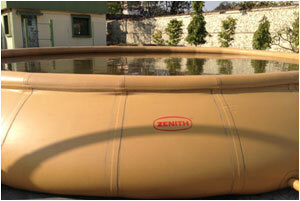 The open top reservoirs are low profile circular shaped tanks. As the tank begins to fill, its unique design allows it to rise automatically. These tanks are used for spill recovery, fire fighting, and storage of potable water, sewage and many other types of industrial liquids. Typical applications include fish hatcheries, watering, rainwater accumulation, drilling and also as a portable pool in your house. Zenith® Vertex is farmer's best friend. It can be used as a water reservoir for irrigation of agricultural fields. UPVC valves are healthy and long lasting.